When it comes to conversion rate, your WooCommerce returning customers are the most valuable type of customers. There are various studies that show the value of returning customers. According to a study made by CMSWire, every time a customer buys a product from your store, he is more likely to buy again. Buyers who have made a single purchase have a 27% chance to make a second one. With every additional purchase, the chances of another purchase are increasing. By the time someone has bought from your store for the fourth time, there’s a 59% chance they’ll return again. According to their study, returning customers make between 25-40% of the total sales annually. Some studies go as far as claiming that attracting a new customer, costs your business between five and twenty-five times as much as keeping an existing one. Attracting a new customer, costs your business between five and twenty-five times as much as keeping an existing one. To put it simple, if you bring back a first-time customer to buy again, it is more likely that they will become loyal customers. There are a ton of things that you can do to convince first time buyers into making a second purchase. This includes things like rewards for multiple purchases, customer discounts and loyalty programs. But before you even try to implement any of those techniques, first, you need to have a way to separate the first time buyers from already loyal customers. Retaining existing customers is a lot less expensive than acquiring new ones. Existing customers are already familiar with your products and services and have some level of trust in your business. By targeting existing customers, not only that you save resources on customer acquisition but also you will reduce costs for customer education and training. Returning customers are also alot more profitable. According to a study made by Adobe, only 8% of returning customers are responsible for 40% of the eCommerce revenue in USA. As you can see, knowing who your returning customers are can be very important for your online shop success. If you are running a WooCommerce shop, you have probably noticed that there isn’t an easy way to find your most active/returning customers. This is where the Users Insights plugin comes in. With the WooCommerce module, you have the ability to analyze your registered WordPress users data and find the most active buyers on your online store. The WooCommerce module tracks the Number of orders that the users have made as well as the Last order date. 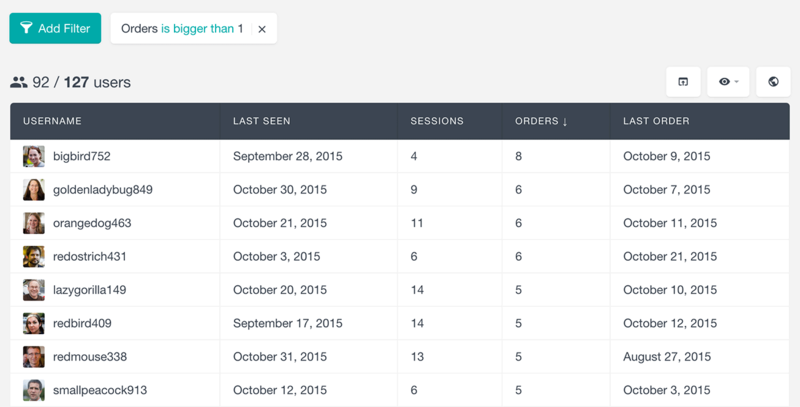 It also adds the ability to filter the users by the products ordered or by their orders statuses. By comparing the number of orders made in a specific period of time, Users Insights allows you to analyze your WooCommerce customers list to find new, inactive and returning customers on your online store. New customers will be the recently registered WordPress users that still haven’t made a single purchase. For example, you can list the new customers by adding a filter “Order number is 0” and a second filter “Date registered is less than 1 month ago”. Inactive customers will be all of the customers who have registered a long time ago but still haven’t made any orders. For example, in order to get the list of inactive customers you can add a filter “Order number is 0” and date registered is more than 60 days ago. If you want to turn this customers into active, you might consider implementing a customer win-back strategy. In order to see the list of all the returning customers on your online store all you need to do is add one filter – “Order number is bigger than 1”. 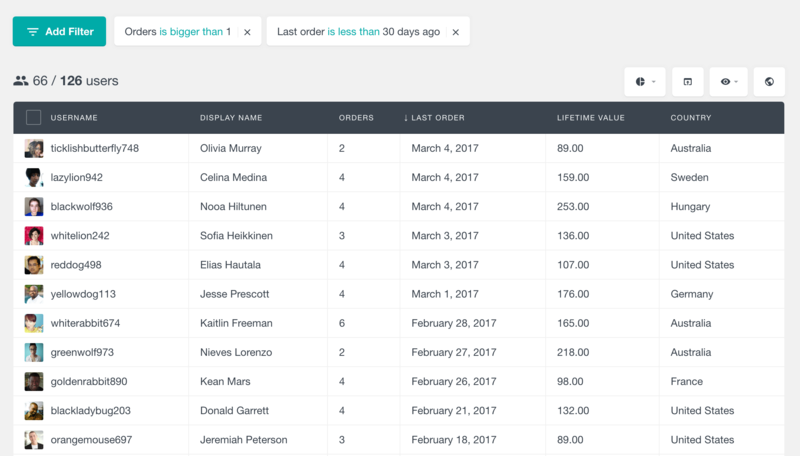 By clicking on the Number of orders field in the Users Insights table you can order the list with returning customers by their number of orders. This will give you a quick overview of your most loyal customers. 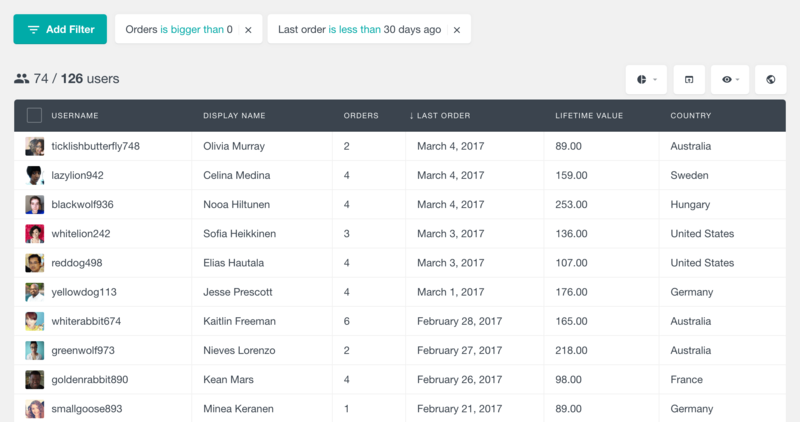 Once you have the ordered list you can further click on the name and see a full list of orders that particular user has made. Another example would be to find all the users that have made exactly 2 purchases, since we know (from the studies mentioned above) that these are the customers that are more likely to buy again. We can do this by simply adding a filter that has a number of orders is exactly 2. According to the research made by rjMetrics, the majority of spending (over 69%) by customers, is in the first 30 days since the first purchase. This means that the window for effectively re-engaging a first-time buyer is within the first thirty days. Another important information about your returning customers is their proportion in relation to all your customers. You might need to find how many of your WooCommerce customers are one-time buyers, and how many are repeat customers. In order to do that, first you’ll need to find out the total number customers, you’ve got. To do this, just filter all users who have more than zero orders. And now it’s time to find the proportion of WooCommerce new vs returning customers. Using the information we’ve got earlier, we know that the total amount of returning customers is 92. So, in this example, our repeat customers proportion is 73% overall. But this information can be explored even further. You may want to know your WooCommerce new vs returning customers proportion in the last 30 days. There are many ways to tackle this issue. The best one is filtering your customers by the order date. Thus you can filter out only orders in the past month and see how many WooCommerce customers are returning vs one time. So, in this case, we’ll divide 66 by 74 and we’ll find a 89% proportion. This means that for orders made in the last month, our repeat purchase ratio is 89%. You can also take other approaches for finding how many WooCommerce customers are returning vs one time. For instance, you may filter out users based on their registration date. This is going to show you your repeat purchase ratio for customers registered only in the past month. Another idea is filtering users by their lifetime value. For example, for your most profitable customers, how many of them are new and how many are returning? Now the sky is the limit, you can choose many other ways to slice up your data and get a better understanding of your returning customer profile. You can choose many other ways to slice up your data and get a better understanding of your returning customer profile. Having this kind of information about your customers can be a good opportunity to create a marketing campaign for your existing customers. You can easily export the users emails by using the Users Insights export functionality and set up a few different mailing lists, so you can create a customized offer depending on the type of customer. Targeting your existing customer base is a very effective way for generating more sales – these are the people who have already shown interest and know about your products and some of them have already trusted you to make a purchase, so by providing them an extra incentive to purchase again you should see good conversion rates. Finding the returning customers rate should be just the tip of the iceberg in your customer retention marketing strategy. By customer retention, we usually mean efforts and metrics to keep current customers satisfied. Usually, we consider that we have retained a customer for as long as they consider our products their desired solution. This goes beyond the cold numbers and reaches the customer relationship itself. These metrics are important because loyal customers are the backbone of any company. They usually are there to support a product line or even test your new products. Often, engaged customers provide feedback and ideas. In addition, they can provide recommendations, referrals, and testimonials, which is the most effective form of marketing. We consider that we have retained a customer for as long as they consider our products or services as their desired solution. When it comes to how to measure customer loyalty, it really depends. Usually, for subscription-based businesses, we simply measure how long a customer has been a customer. There are other important factors such as upgrades and months above average. In other words, for how long this customer is subscribed compared to the average customer. This metric is particularly important, as it can show you what you are doing differently to keep these long-lasting relationships. As for one-time services or products, usually, the repeat purchase ratio is a good metric. In addition, you should consider other metrics as the customer’s lifetime value, and the average buying cycle. The average buying cycle is good to predict how long it takes between two orders. Customer Support: A branch of communication, but too important to be on its own. Usually, your customer support defines the entire dynamic of your customer relationship, from cheap-impersonal to a deep meaningful connection. This is why customer is 4 times more likely to move to competitor if they experience customer support issue. Improving Products and services: Better products or special products for current customers. The exclusivity factor is also certainly a great strategy. As a general rule, you should try to make decisions simple for your customers. Proactiveness: If you feel like a customer is getting inactive or indifferent, try to win them back. Being proactive is a great way to restore a relationship. Marketing: Instead of giving prizes to new sign-ups, why not at least do this for long-time customers as well? For instance, a discounted upgrade, some free samples, gifts on their repeat purchases. When we think that relationship marketing is much cheaper these strategies seem inexpensive.